An online giant’s arrival in Australia will shake up electrical wholesaling. Paul Skelton paints a picture to challenge existing sales models. It is 22 years since the world was introduced to Amazon.com – then a simple online book store. However, founder Jeff Bezos already had big ambitions for the fledgling company. “We are able to offer more items for sale than any retailer in history, thanks entirely to the internet,” he said at the launch. At that time, the e-commerce landscape was very different to today’s scene. Online stores were few and far between, and the infrastructure for an expanded e-commerce world was lacking. After all, dial-up was still the main way of accessing the internet in 1995. You only have to watch the Johnny Lee Miller and Angelina Jolie film Hackers to see how frustrating surfing the web could be. So success in that environment is testament to the dedication of the Amazon team. And that dedication has paid off in modern times: Amazon is the world’s fifth-largest company by value, worth more than $US400 billion ($AUD537 billion). Its annual turnover is almost 50% greater than Google’s parent company, Alphabet, and four times higher than that of Facebook. Last year, Jeff Bezos became the world’s second-richest man, with a personal net worth of $US84.7 billion ($AUD113.9 billion). The company is now up and running in Australia, and it is seeking local suppliers to fill its large distribution and fulfilment centre. And this is just the tip of the iceberg. The Australian Financial Review reports that Amazon has lodged more than 250 trademark applications in Australia ahead of the rollout of its general merchandise, fresh food and video streaming services in the next few years. In fact, Macquarie Bank estimates that Amazon’s Australian sales could reach $14.5 billion by 2025. This would be achieved by taking market share from department stores; appliance, sporting and clothing retailers; and even supermarkets. It’s understandable then that Amazon’s launch has sent many large retailers reeling. Woolworths, for example, has reportedly established a business unit to respond to the Amazon threat. Wesfarmers is also developing ways of speeding up distribution, improving its ‘bricks and mortar’ and online stores, and securing long-term agreements with suppliers. This is all for good reason. According to a Nielsen survey in January, 75% of Australians aged over 18 are interested in Amazon Australia and 56% are likely to buy from its Australian site. This is particularly damning for many big retailers. However, the building and constructions industries are not immune to the Amazon effect. In 2015, Amazon launched an offshoot of its popular offering called Amazon Business, which specialises in trade-only products. Two years later, the site has more than 400,000 registered buyers and a base of 45,000 sellers. It achieved more than $1 billion in sales in its first year. Amazon Business is available only in the United States, the United Kingdom and Germany. Amazon’s entrance into the Australian market means it’s only a matter of time before Amazon Business arrives and upsets the wholesaler apple cart. 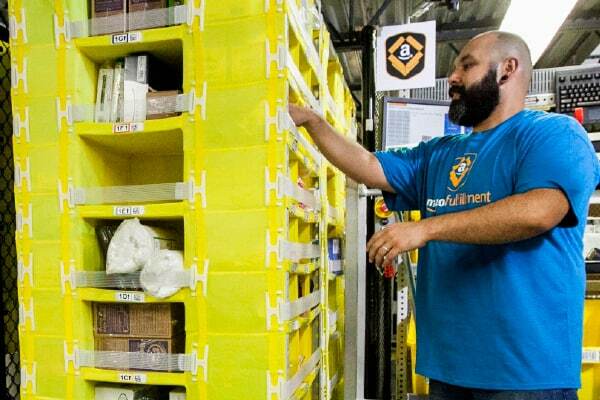 “We’ve heard from business customers that they love the convenience of shopping online and want an experience at work that is similar to how they shop at home,” says Amazon Business vice-president Prentis Wilson. A search, browse and shopping experience tailored to business purchasing. The ability to view multiple offers on a single product page for easy price comparisons. Business-only products such as hard-to-find items – traffic signs, industrial deep fryers, antibodies, 55-gallon steel drums, dent pullers, etc. Access to the Amazon tax exemption program. Placing orders and financing purchases using Amazon’s pay-in-full credit line or revolving credit line. “It’s only the beginning for this new market – we will continue to build out features in areas like product support, payments, shipping and pricing,” Prentis says. In an interview with Susan Bloom of The Electrical Distributor (tED) magazine, Amazon Business general manager Petra Schindler-Carter says her company and wholesalers can easily coexist. “We have a great deal to learn from the electrical distribution industry and we’ve barely scratched the surface. The dynamic between manufacturers, distributors and manufacturers’ representatives is complex, with each link in the chain adding value to the customer. “We’re growing in our understanding of that path to market and how we can add value as a complementary channel for customers and sellers. “We’re excited to be a part of the conversation and to be given the opportunity to talk about what we’re building. In fact, there are many tenured Amazon sellers who have been reaching customers in our Business, Industrial and Scientific Supply (BISS) category for more than 10 years, in many cases using the marketplace as their primary e-commerce channel. That all sounds very positive, but perhaps the following is more telling. “From our end, we’ve continued to pursue innovation around customer experience and fulfilment that could be a benefit to distributors looking to drive incremental business and access our logistics network and expertise,” she says. In other words, wholesalers that don’t fundamentally change the way they do business – or buy from Amazon – will be at risk. The good news for local trade outlets is that Amazon has given itself two years to get its consumer offering up and running – a long time in the business world. Even then, it will probably take a few years before it starts to turn a profit locally. So, there’s still time for you to ‘Amazon-proof’ your business. Savvy wholesalers will be shoring up their supply lines, investing time and money in understanding their customer base, and developing a robust e-commerce platform that complements their conventional stores. To streamline operations it will probably mean closing some outlets, particularly in over-serviced areas (there are seven electrical wholesalers in the Victorian city of Ballarat – go figure), as well as consolidating other services. But that’s not to say wholesalers should abandon the bricks and mortar sector – such a move would be foolish. Wholesalers – as well as contractors – only need to look to the US to see the potential fallout brought about by Amazon’s entry into the market. Scott Costa is the publisher of tED magazine. He says the US is still trying to understand the full ramifications of the Amazon Business launch, which has left a lot of questions unanswered. “Since May 2015, Amazon has sold more than $1 billion in products to B2B customers through its Amazon Business website,” Scott says. “That’s not just electrical products, but it’s a very significant number. The question is, what’s next? “In the US, Amazon [is building] more warehouses. It calls them distribution centres, and it’s obvious it is building them in strategic locations to get products to the people within hours instead of days. This includes the B2B customer. Amazon Business is also hiring. “As of last August, Amazon Business was looking to fill more than 11,000 positions. Many of them were for product specialists such as experts on electrical products. There are also a few wholesalers that have joined with Amazon to sell their products online. “The contract with Amazon if very restrictive, and most distributors don’t make a lot of money selling through them,” Scott says. “It basically replaces the cost of setting up and maintaining their own e-commerce or web store. We are watching this to see if it is just a trend or if more of our distributors are planning to use Amazon. “Nonetheless, Amazon is definitely on the radar for many of our electrical distributor members. “They are aware of the need to improve their own e-commerce offerings to match Amazon. They also know they need to improve relationships with their supply chain partners. “Amazon Business needs products to sell in order to be successful. Where do they get the products? From the same manufacturers that are supplying our distributor members. Geoff Dart is an industry consultant with more than 30 years’ experience working with the likes of Bunnings, Mitre 10, Reece, Lawrence & Hanson and Cetnaj. “Wholesalers are going to be in a lot of trouble once Amazon opens in Australia,” he says. Geoff points to a wide-reaching ignorance of what e-commerce could offer to existing wholesalers. “I won’t go so far as saying they live in denial. But I do believe there’s a generational issue at play. Our industry relies a lot on senior members, which can inhibit change and often leave us lagging behind. “So many in that older generation still take the books home for Doris to do, even though there are much better ways. “A bigger challenge could actually be that this older generation doesn’t even want to change. “I believe that if you’re a wholesaler you’re a dinosaur. So many just buy stuff, stick it in a shed and flog it. What value are you adding? And why don’t you have a good website or e-commerce system? Third-generation electrical contractor and former president of the National Electrical and Communications Association (NECA) Wes McKnight has been talking to the heads of several wholesale groups, to see how they plan to tackle the Amazon threat. “Understandably, wholesalers are quite fearful – some have concerns that it will blow everyone out of the water,” Wes says. Like Geoff, Wes believes this to be a generational issue. “Guys in their 20s now have been buying off the internet since they were 12. That will carry over into their work lives. Wes says that teaming up with Amazon makes a lot of sense for suppliers, particularly smaller or specialist companies. Luke Bolton is the director of Plumbers Choice – an online trade-only plumbing wholesaler. He believes it will be bricks and mortar companies reliant on the DIY market that will be most affected by Amazon. “Existing wholesalers need to focus their attention on trade clients and differentiate themselves from the DIY market,” Luke says. For electricians, TradeZone has a similar approach – trade-only sales. “We are very closely watching Amazon’s impending launch,” director Robert Kingston says. “But we feel that it can only lead to positive things for TradeZone because it will encourage people to go online for their electrical needs. Founded in 2016, TradeZone is a pure e-commerce website. The company has one trade counter in the Gold Coast suburb of Helensvale in Queensland but otherwise relies entirely on its e-commerce platform. “We recognised there was an opportunity in the electrical wholesale market because the electrical industry was a little bit behind the times when it came to e-commerce,” Robert says. “In other industries, online procurement commands quite a large market share. But not so for the contractor market. “Of course, online shopping doesn’t suit everyone in the electrical industry – there’s still demand for the local wholesaler. “However, so many contractors are trying to get ahead, to have a competitive edge, and in order to do that you’ve got to work harder than the bloke next to you. That means potentially buying materials at night, online, and getting them delivered to your house. Luke says being ‘online only’ requires explaining to younger members of the industry why trade-only suppliers are important to the viability of their trade. Robert agrees, and says younger people are impatient and without loyalties to particular things. Of course, there’s also the potential for some companies to over-react to the pending launch of Amazon Business. “You have to remember that wholesalers have a very successful business,” Robert says. “They’ve been around for a long time, they do big volumes and they have a loyal customer base. So it will be very hard for them to change to a pure-play web platform, which probably isn’t the best move anyway. “That said, because of their current success, it will be hard for them to get motivated to make any changes at all. “The good news is that Amazon will not have access to all the brands that wholesalers have. Key brands say they aren’t going to sell directly to Amazon, as that would contradict everything they have said in the past.